Anyone who knows me is well-aware that eating is high on my priority list. In fact, one of the first things I do when planning a trip is to search guidebooks and the Internet to get an idea of what to eat there. After trying many different kinds of restaurants over the years, I have come to the conclusion that the best meals are simple ones found in small, ethnic eateries. When a return trip to San Francisco presented itself, I rubbed my hands together in anticipation and got to work on my “research.” I was overwhelmed by the range of culinary experiences the city had in store: Ethiopian, Turkish, Afghan, Sardinian, Burmese. I could hardly contain my excitement! 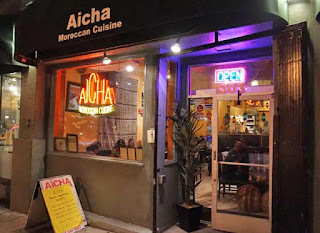 On our first night we chose Aicha, a Moroccan restaurant a short walk from our hotel. This tiny place—maybe ten tables—has a relatively small menu, apparently a bring-your-own-wine policy, and quite a diverse clientele. 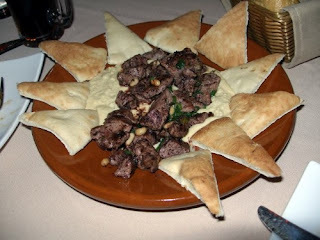 Hubby went for the lamb tagine, a type of stew with onions, prunes, and almonds, while I chose the grilled lamb kebab with rice and salad. Each dish seemed like “good home cooking”…exactly what our jet-lagged selves were looking for after two tiring flights and a long walk through downtown. The next afternoon, after wearing ourselves out climbing Telegraph Hill to see the view, Coit Tower, and the famous parrots, we were starved. 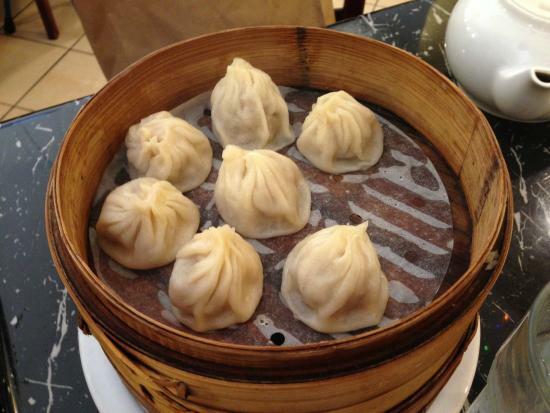 Fortunately, Chinatown was just a few steps away and we had our choice of dim sum locations on Jackson Street. The first one on our list had exactly one table and maybe three chairs with people occupying two of them…so we were off to place #2. Bund Shanghai down the street had an actual dining room where we could sit and rest our poor, aching feet. The guy sitting next to us was having a bamboo steamer of soup dumplings that were irresistible so we got that along with an order of crab and pork soup dumplings. Hot, juicy, and delicious. So far this trip, the Cheapo Snobs in us were flying high! Walking around we had noticed an Indonesian restaurant which looked quite appealing. So on the second evening we decided to try Borobudur, a really popular spot which required some waiting for a table. But, boy, was it worth it! 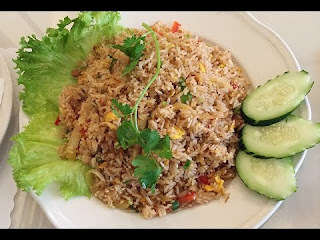 I had read that one of their specialty plates was Nasi Goreng Kari. Described unassumingly as “a spicy curry fried rice dish with egg and onion,” it was so delicious and so unlike any fried rice we had ever had before! Along with it we had Kari Udang, shrimp and vegetables in coconut curry sauce, and a house carafe of white wine. Great! Of all the terrific meals we had had in San Francisco this trip, the most inventive was at Saha on our last night in town. 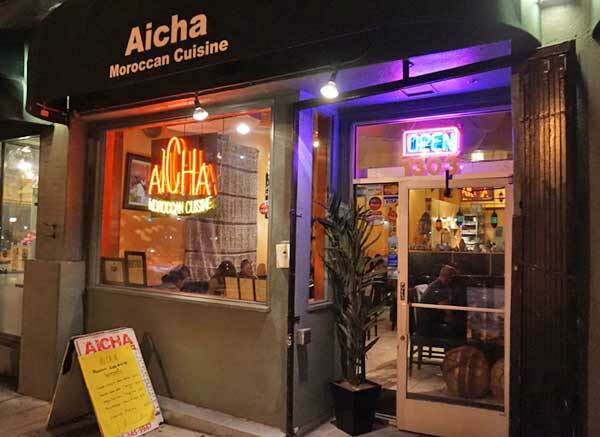 An “Arabic fusion” restaurant located interestingly in a hotel lobby, it is the creation of a Yemeni chef, who was schooled in France and has lived in the Bay Area for thirty years. The“small plates”/tapas restaurants can be confusing but our delightful waitress was a big help in deciding the number of dishes which would be right for us. We started with small Egyptian okra in a tomato sauce, followed by Lahem Sougar, a traditional Yemeni dish served over baba ganoush with pita bread. Really the best lamb I’ve ever had! The third plate, a special, was also delicious though I can’t remember exactly what it was. We even celebrated our good luck with dessert and some bubbly Prosecco. As you can tell, we were not at all disappointed in our meals in “the city by the bay.” Nor with the sightseeing in and out of town, for that matter. San Francisco is one of my favorite cities. Can’t wait to get back there.